Ten people braved the wind as we trudged into Amazon Hollow. 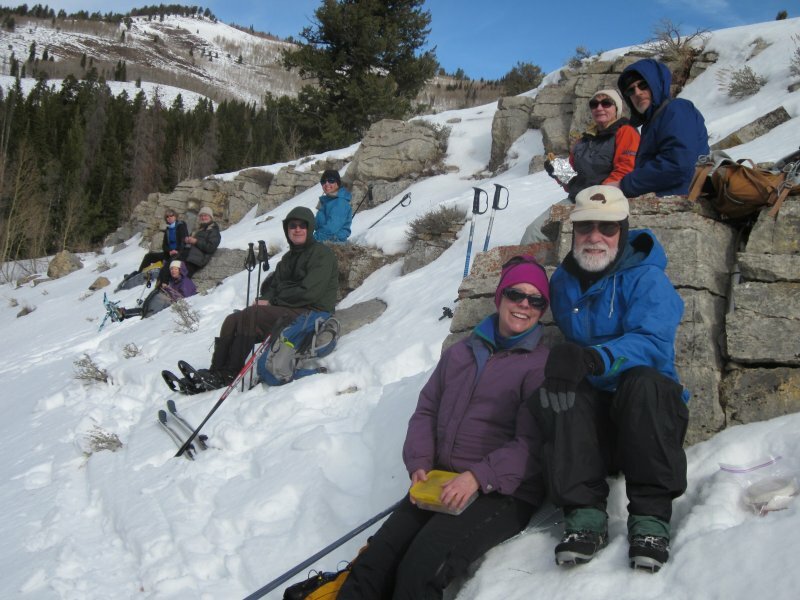 Dan led the way on snowshoes along with Jane, Kathy, Christine, Monika, Jeannie, Tim and Jim. Die-hard skiers Dave W. and Dave P. came with their telemark and touring skis. Our planned start was near the highway sheds, but the wind prompted us to move to the more sheltered conditions down in Amazon Hollow. We had to break trail most of the way, since few others had traveled this route. A rocky outcrop provided a relatively dry but breezy lunch site. Everyone went another 1/4 mile after lunch, but the group split up for the return trip. Most of us went back the same way we came, a 3 mile round trip, but 4 adventuresome people returned via a slightly shorter but steeper route for a 2.9 mile trip total (the topo map below shows the shorter route).